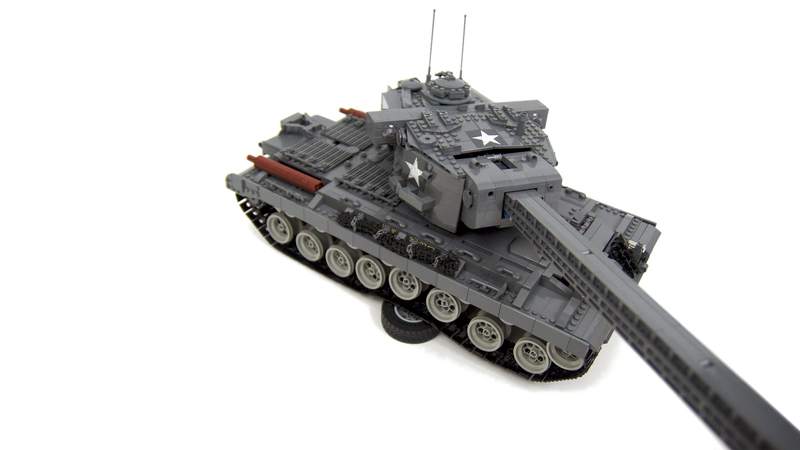 Model of the T29 US heavy tank prototype. 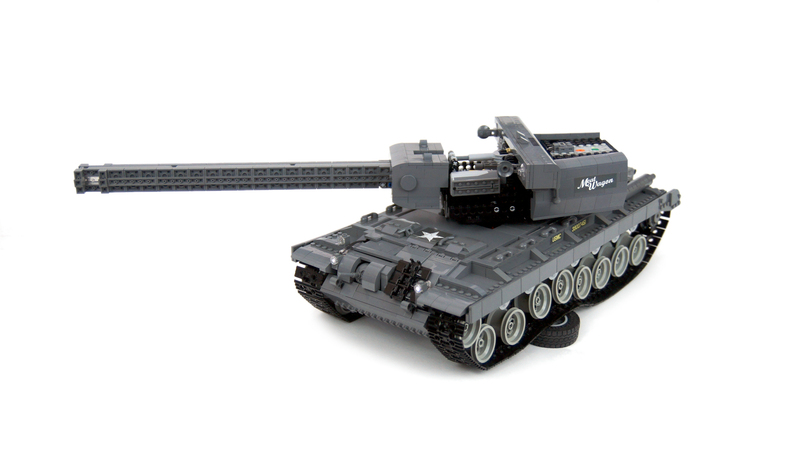 Features drive, steering, elevated cannon with a shooting mechanism, rotating turret, ball-mounted front MG panned & tilted remotely, opening engine deck with a V6 piston engine, full suspension, lights, custom stickers and SBricks. 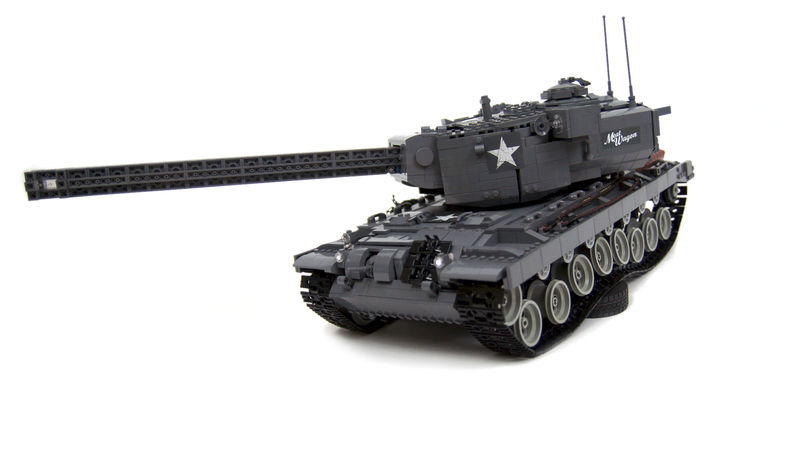 This tank was built with one function in mind – it was supposed to shoot through the barrel. 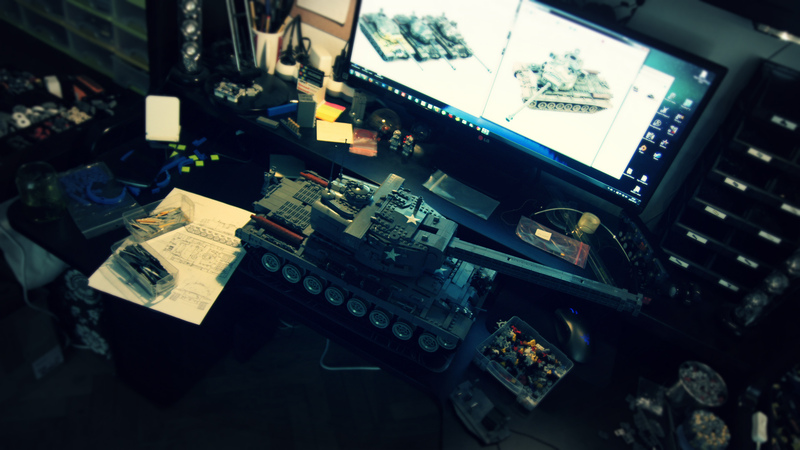 I was told such a function is mandatory basically every time I’ve built a tank. It didn’t seem so interesting to me, as shooting mechanisms aren’t very complex and shooting through the barrel requires the barrel to be big, blocky and ugly. 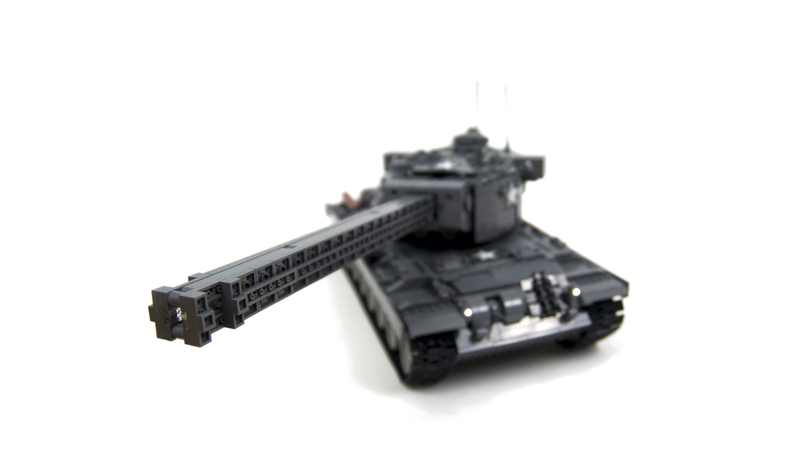 This is why I’ve made my earlier K2 Black Panther model shoot from an opening hidden compartment in the turret, but that apparently wasn’t as cool as shooting through the barrel. 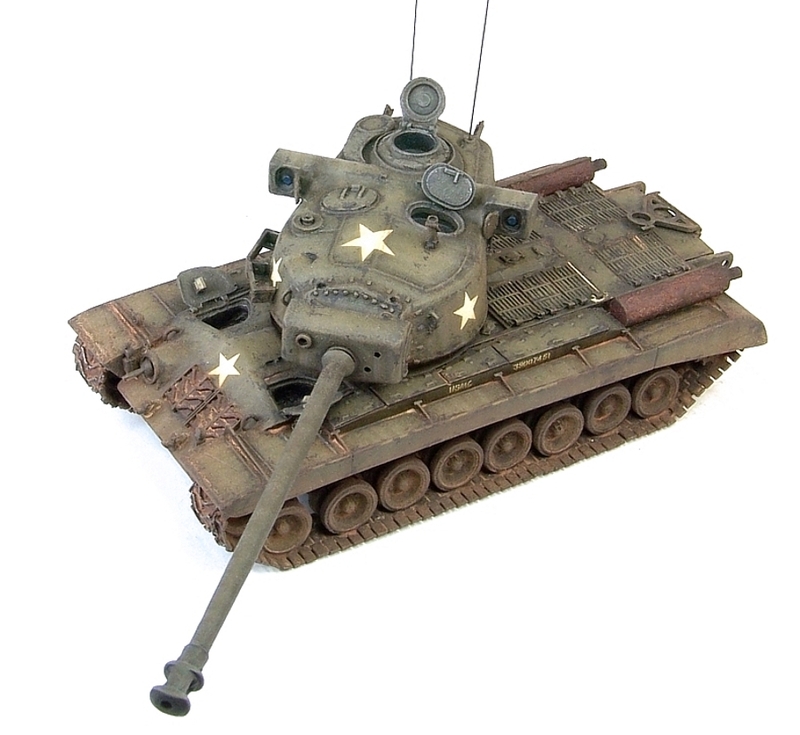 The original T29 was born in 1944, when US armored forces, struggling against Tiger tanks in Europe, started encountering a very ugly surprise called Tiger 2. 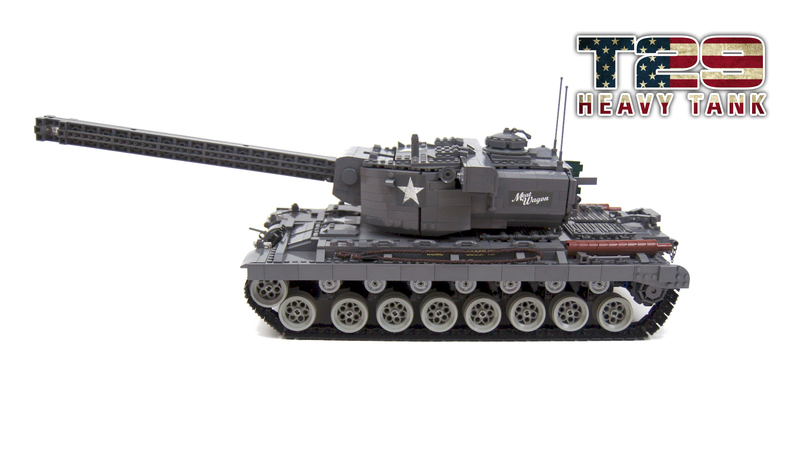 First reaction of the US command was… redesignating the M26 Pershing tank as a heavy tank, despite the fact that it weighted just 46 tons. 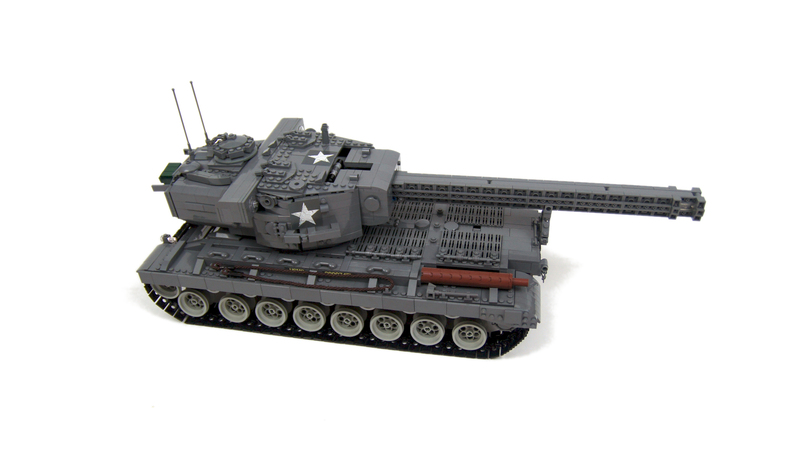 The second, more serious reaction, was a development program for a proper heavy tank, which started with the T29 project, unofficially designed to hunt Tiger 2s. The resulting tank was quite interesting an in many ways innovative. It included an advanced drivetrain that merged transmission, steering system and brakes into a single unit, and tracks fitted with 5-inch extenders on the outer side, intended to improve cross-country performance and giving the tracks unusual “rolled up” appearance. 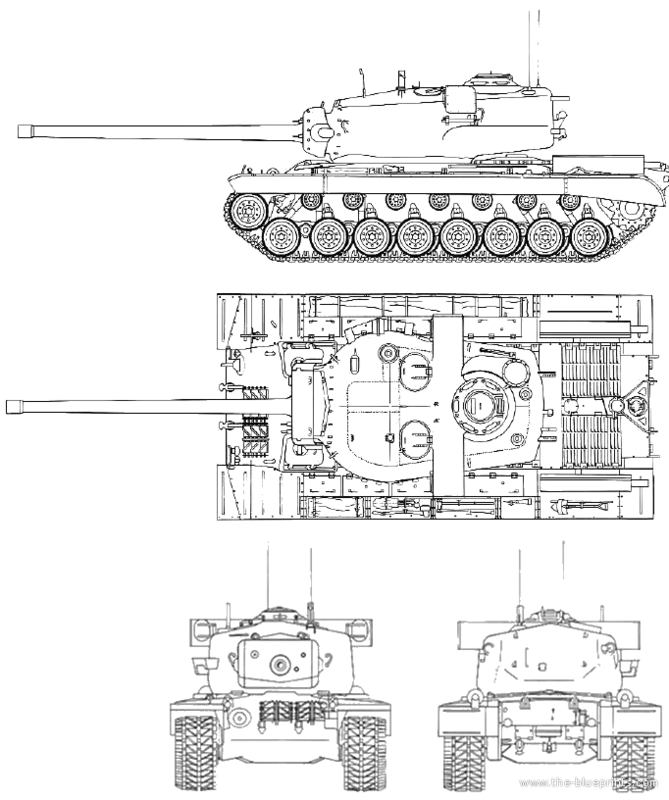 It was aalso a massive, 64 tons heavy monster outperforming Tiger 2 in almost every aspect, and it was developed into several successive variants designated from T30 to T34. 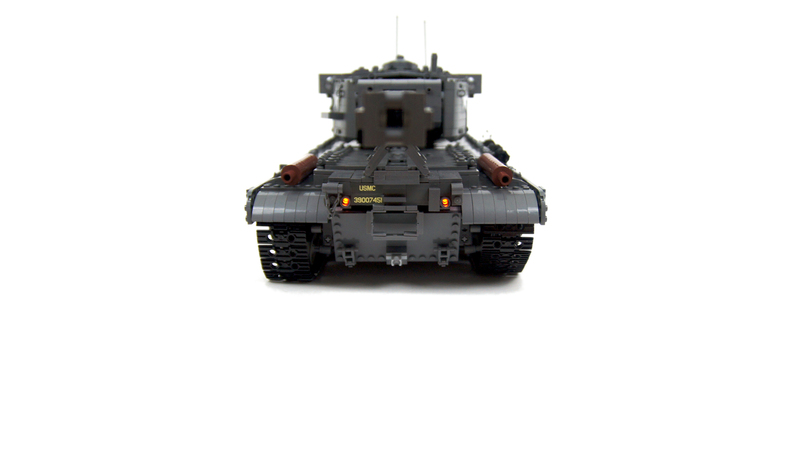 This has created a family of very similar-looking tanks, with the differences being mainly various engines and cannons, as well as details of the turret. 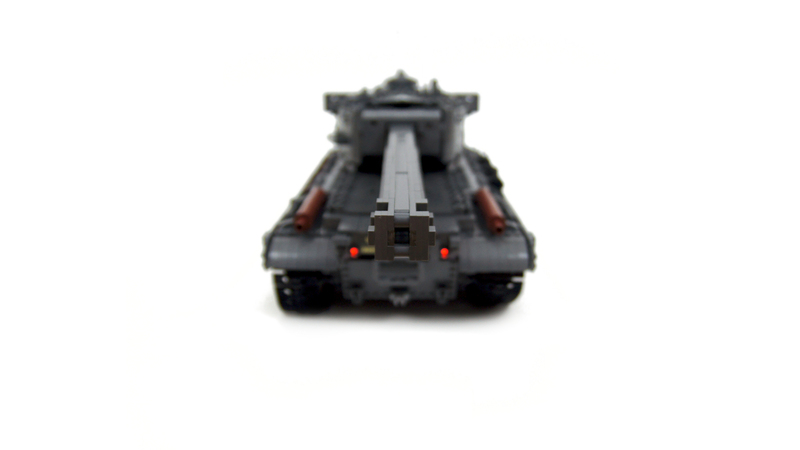 For example in T34, equipped with a larger and heavier cannon, the barrel was counterweighted by welding additional armor plate to the back of the turret. 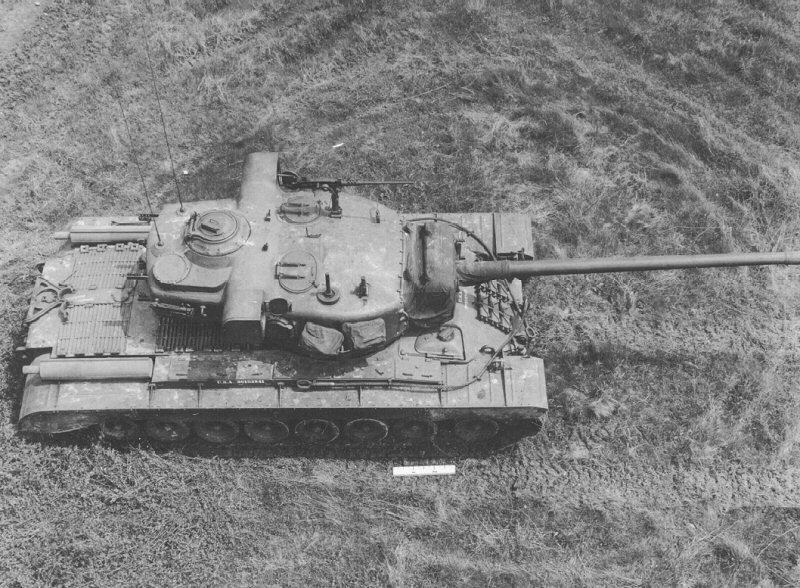 None of these tanks saw service and they all looked alike, but the original T29 stood out because of one of its turret variants which was equipped with large coincidence rangefinder forming distinctive “ears” on turret’s sides. 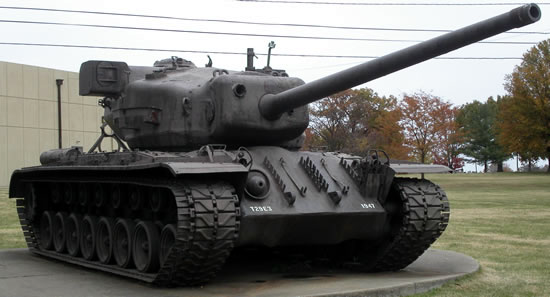 This unusual looking tank was called T29E3, and today only one of three surviving T29s has the “ears” on it. 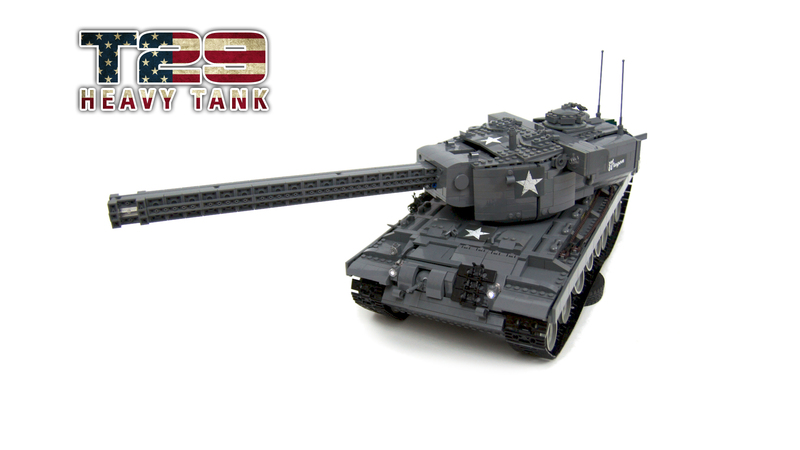 Pictured below: The T95, famous “mobile bunker” (left) looks rather insignificant next to the monstrous T29. 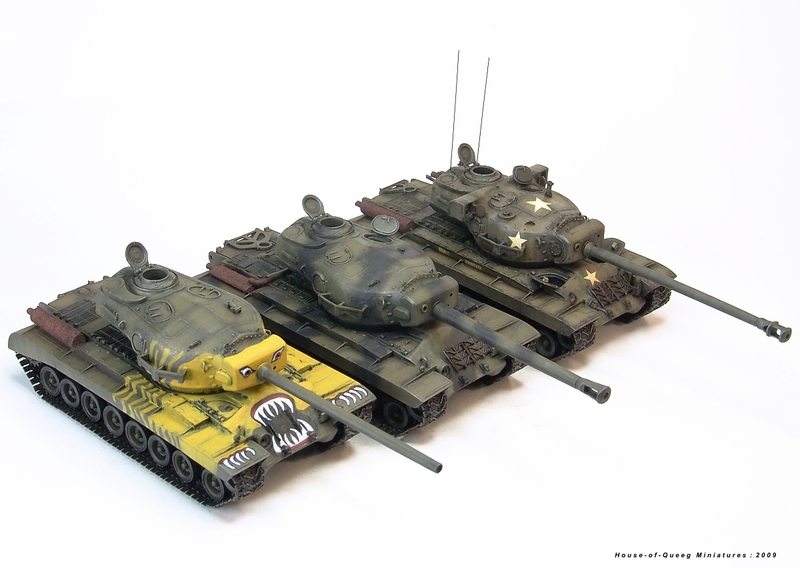 T29 and its variants belonged with a large group of tanks designed too late to see action in WW2. 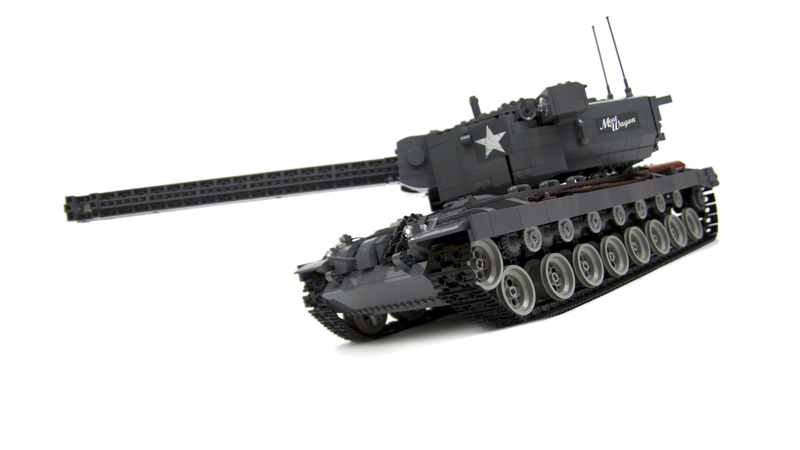 When Nazi Germany surrendered, there was a plan to use T29 against Japan, but project Manhattan and subsequent atomic bombing prevented that. 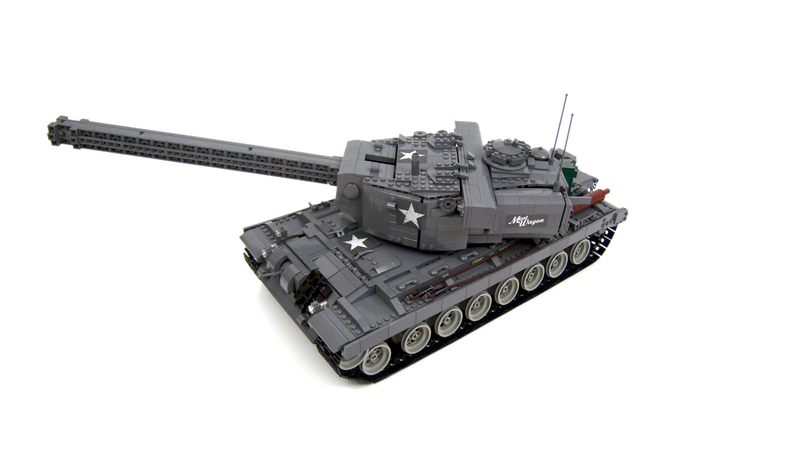 The finished prototypes were used for extensive studying of propulsion and other aspects inherent in heavy tanks. 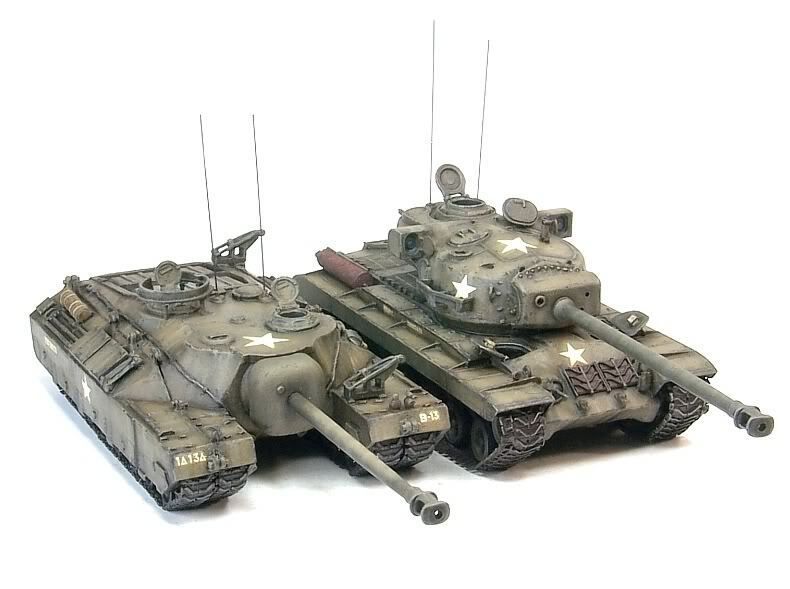 It’s safe to say that T29 had significant impact on many US heavy tank designs to come – for instance, the M46 Patton and its successors bear strong resemblance to the T29 in their key aspects, and personally I’d say that even modern Abrams tank resembles T29 in more than one way. 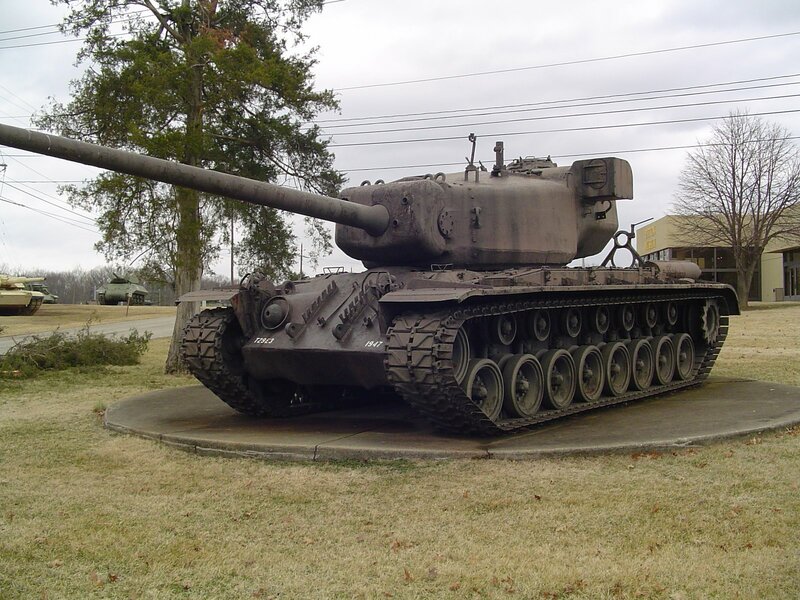 I have come across the T29 while playing World of Tanks, a game in which this tank is well liked and widely recognized for having “bunny ears”. 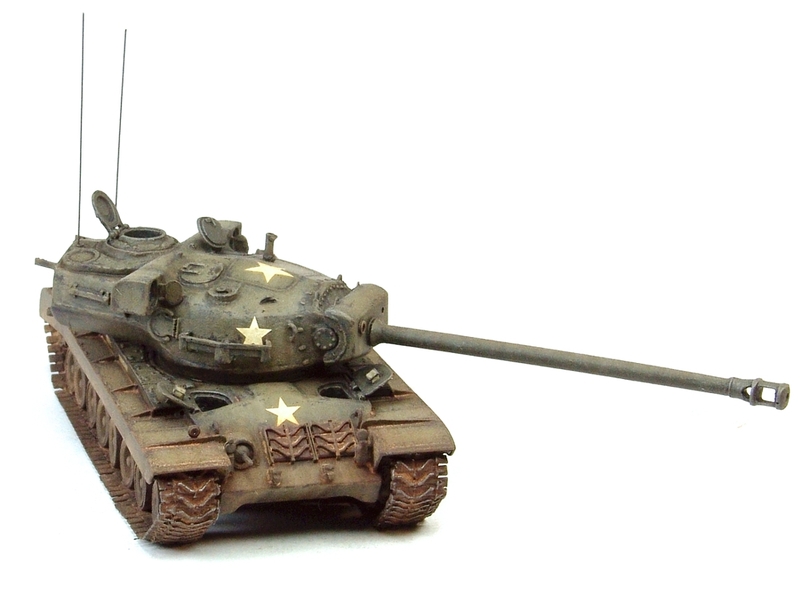 While the T29 is a reasonably versatile tank in the game, its subvariant T34 is much more extreme, unusual and therefore interesting tank to play with. 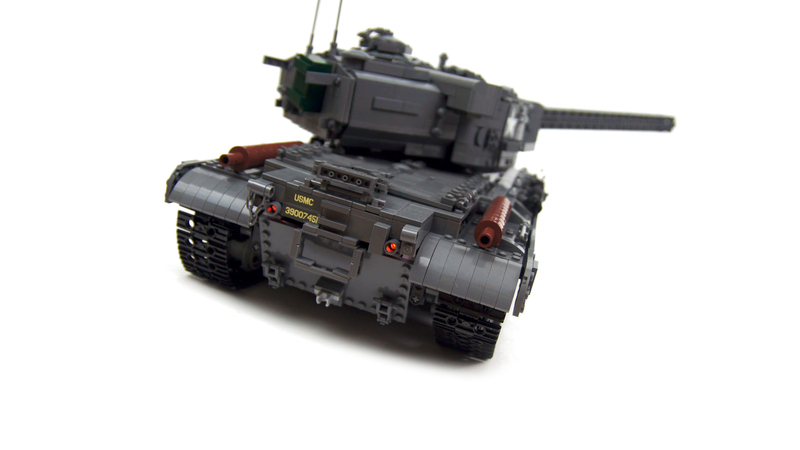 It’s a tank capable of damaging almost any vehicle present in the game, and equipped with a turret so thick, it can largely ignore the enemy fire. 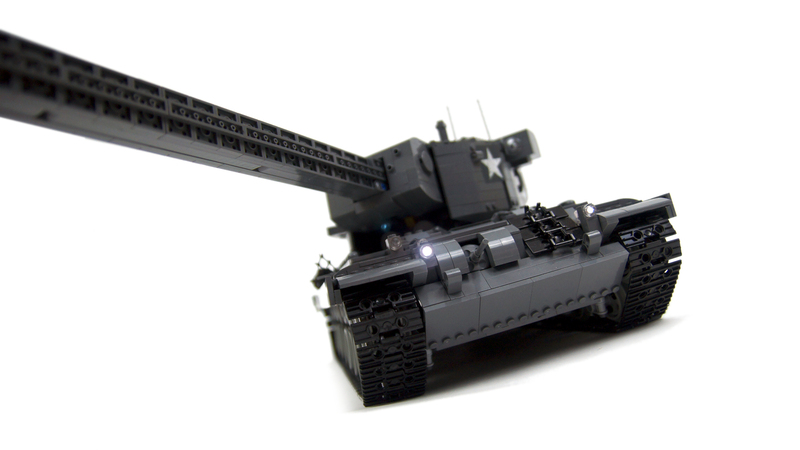 At the same time it comes with a poorly armored hull and its sluggishness and massive silhouette make it an easy prey for the artillery. Playing T34, therefore, requires hiding the hull behind obstacles or terrain and exposing only the turret – a tactic known as hull-down, which has gained the T34 a nickname “hull down king”. When well positioned, it is a formidable enemy to vast majority of tanks, and the usual tactic when encountering a T34 with only its turret visible is “turn around and look for other way around”. My model has been in development for a year due to numerous changes in its concept. I was bored with regular torsion bars suspension, so for a long time I’ve tried to build this model on a suspension using rubber bands with remotely adjustable tension. I’ve tested a number of variants, but each of them took almost entire hull, made installing road wheels difficult and the adjustable tension proved to be of very little practical use. At least once I was about to abandon this project completely, but I eventually decided that it’s better to go back to torsion bars and start from there. Thus the construction of the entire model was restarted no less than four times. 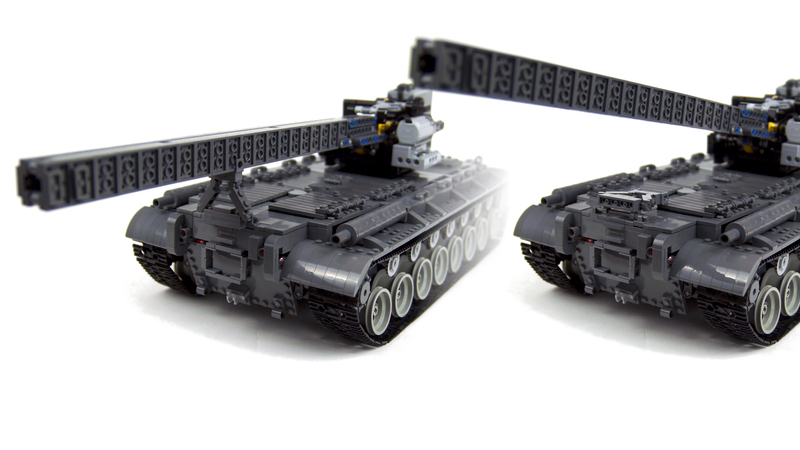 Another concept that became clear early in development was using multiple SBricks rather than multiple PF IR receivers. This was mostly because of the massive turret whose bustle would blot out all IR receivers located anywhere but at the very back of the hull. 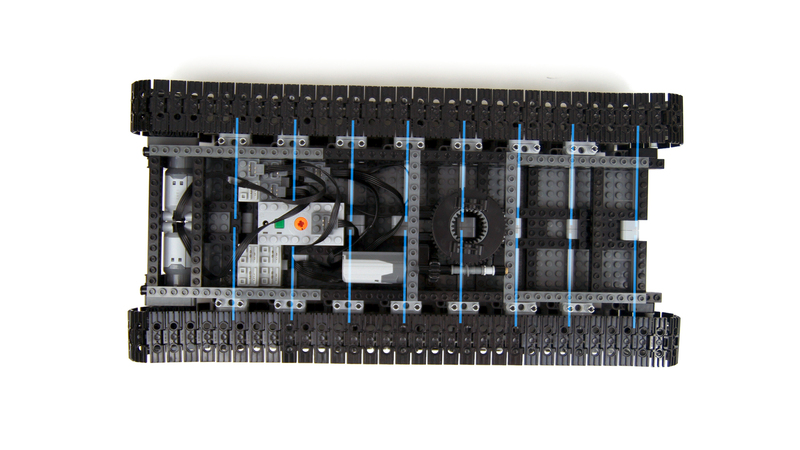 Using SBricks, on the other hand, saved plenty of room (8 functions required 2 SBricks instead of 4 IR receivers) and allowed me to place them wherever I wanted. 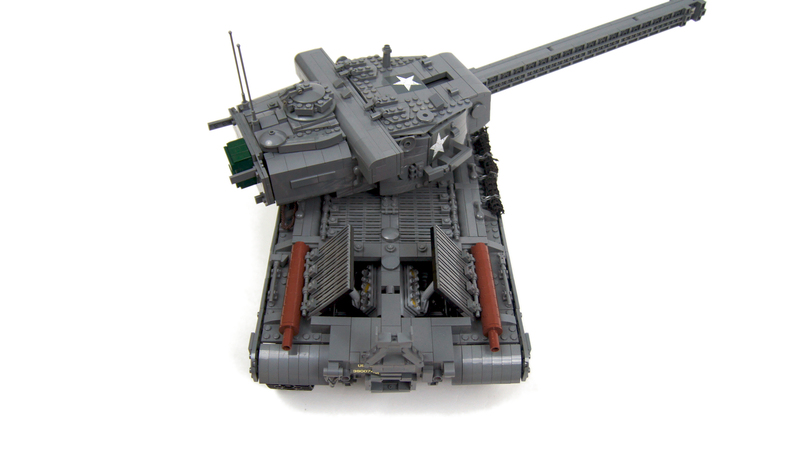 In the end, the SBricks ended up below the turret, slightly behind the turntable. At the very back of the hull were two PF L motors installed crosswise, each driving one rear sprocket with 3:1 gear reduction. Between them and the turret, there was engine deck hiding a V6 piston engine, along with one 71427 motor driving it and two more 71427 motors opening two hatches above the engine. 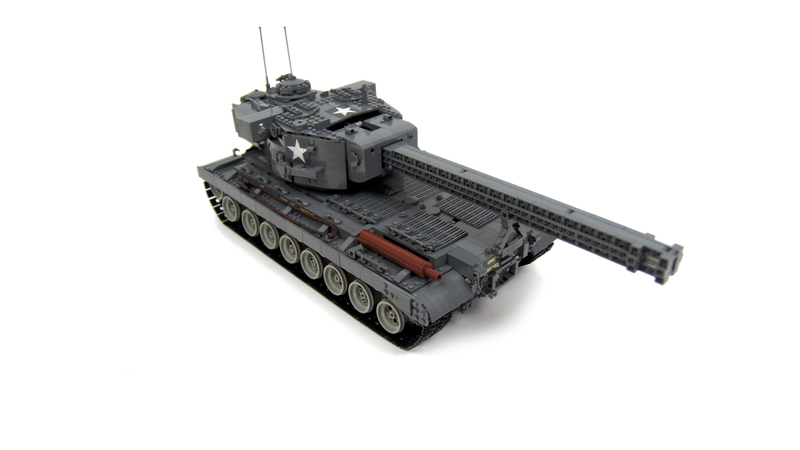 The original tank was driven by a V12 engine – but there was not enough room for it in the model, and besides only 6 pistons would be visible without taking off the turret. 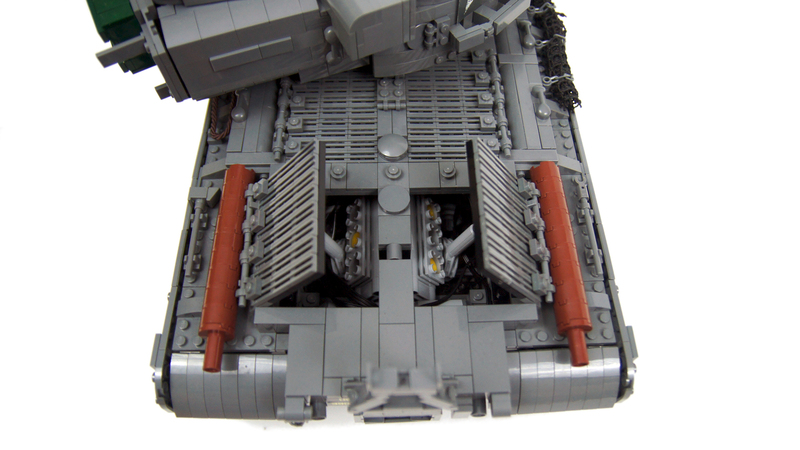 The three 71427 motors are used because they are only 4 studs long, and the two motors opening the hatches are not coupled because of the third motor between them. I have learned a lesson from my Tiger XL model, which was equipped with a piston engine too, and added an unobtrusive on/off switch between the hatches, controlling the motor driving the piston engine. It allowed to engage the piston engine at will rather than have it running noisily whenever power was on. There was an unintentional but cool effect from using the 71427 motor to drive the V6: when turned off, this motor doesn’t stop immediately but gradually slows down over period of 2 to 3 seconds. This effect was transferred to the V6 engine, which made it look more realistic than if it stopped dead the moment it was turned off – instead, it would sort of wind down like some massive marine engine. It should be noted that the hatches, while somewhat fragile, were designed so that they could open under any conditions, even when the gun travel lock was folded down on top of them, as well as when the turret was facing backwards with its barrel on the travel lock. 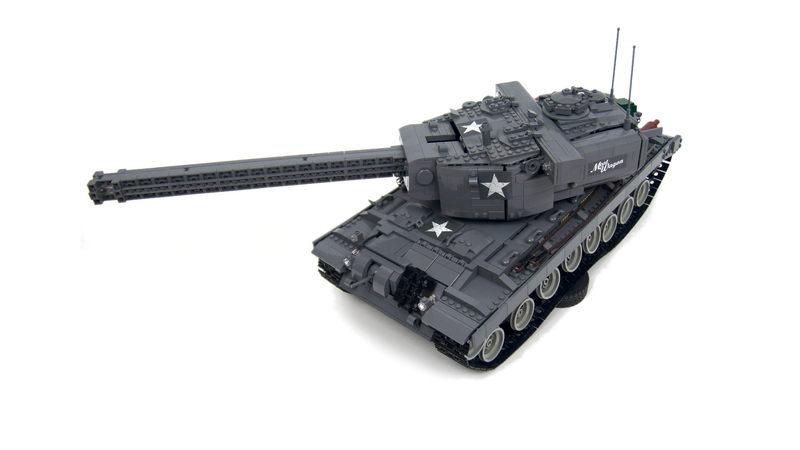 In front of the hull, there was a machine gun with a custom-built ball mount, much like in my Tiger XL, but bigger. 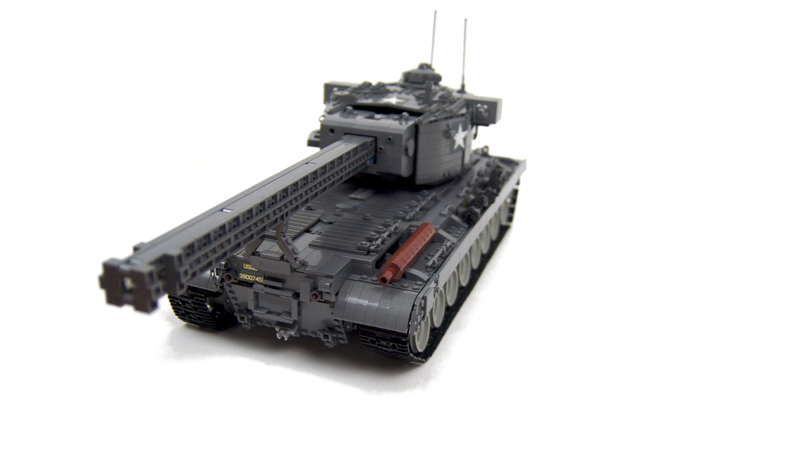 The gun was panned and tilted remotely using two PF M motors driving a complex linkage, and – unlike in my Tiger – it was controlled independently, not coupled with the turret. 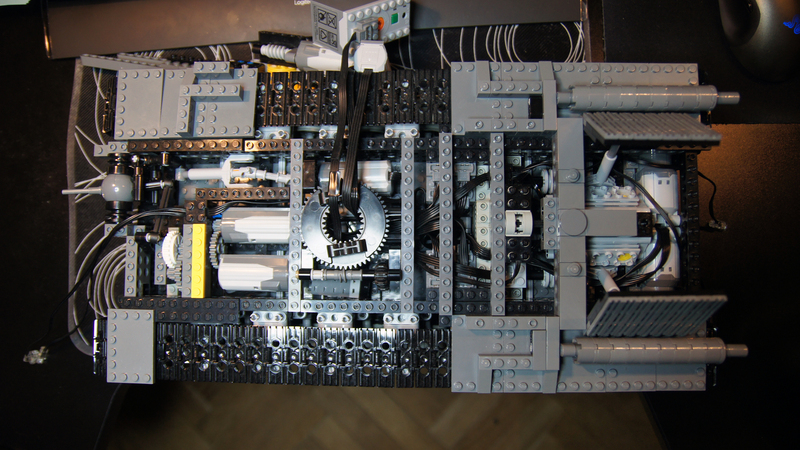 The turret itself was installed on a large Technic turntable of the new type, taken from the Lego 42043 set, and the only difference it really made was that it had less backlash than the older turntable meshed with a worm gear. 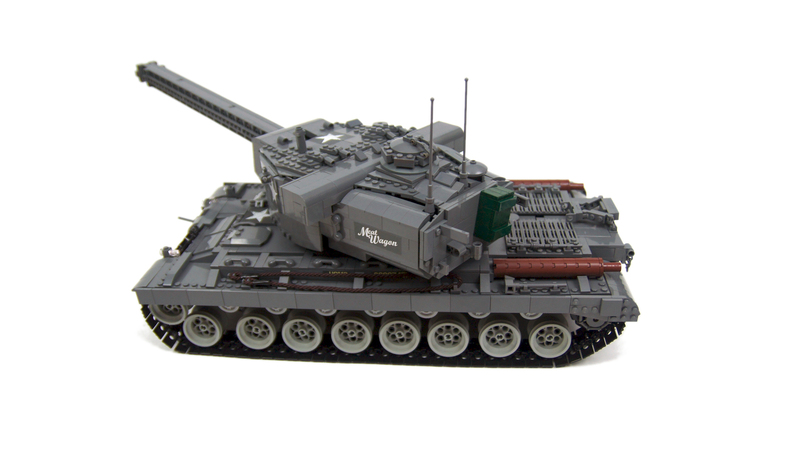 The entire front half of the turret was taken by the firing mechanism, installed as a single unit, with PF M motor included, on one end of the barrel and being elevated together with it. 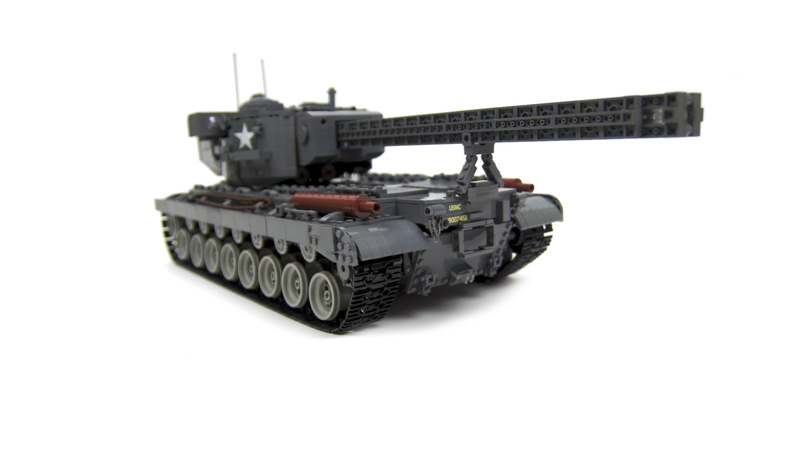 The elevation mechanism consisted of one PF M motor driving one small linear actuator, also located in front half of the turret. The firing mechanism was simply using a shock absorber being pulled back continuously by a PF M motor – a reliable solution, but apparently bad for the motor, as my PF M motor started struggling against the absorber after a while and I had to replace the absorber with a softer one eventually. 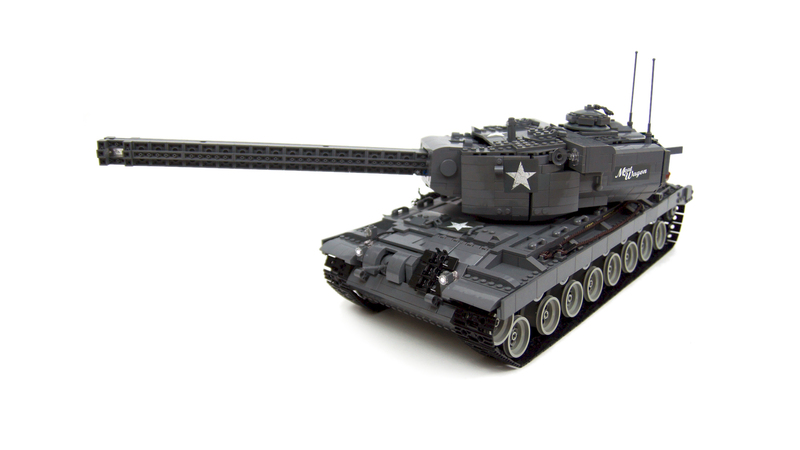 The projectiles were 3L axles with stop, fed from a single beam acting as a 5-rounds clip. The beam was inserted vertically from the top of the gun mantle, and once a round has been fired from it, it would move lower under its own weight, putting next round in the place. 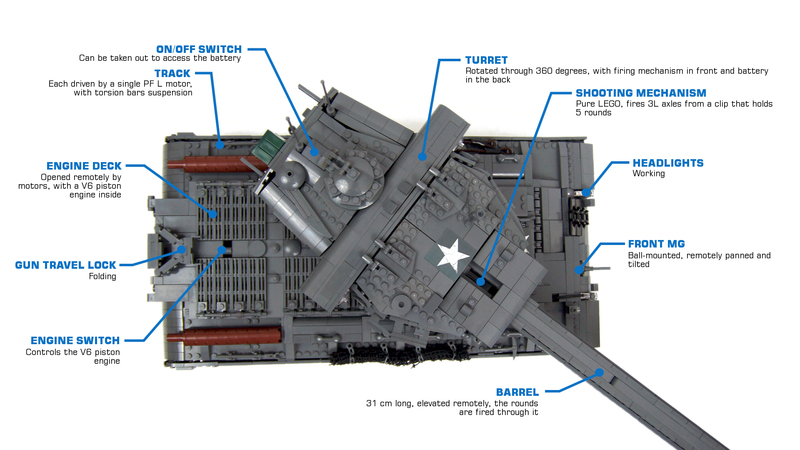 It was a very simple system that could handle more rounds in a single clip if there was more room under the turret. I have used it after testing a number of other solutions, such as axles fed from a chute or from a horizontal beam moved from one side to another by the firing motor. All these solutions were prone to jamming up, and only the gravity-driven clip proved absolutely reliable. Also, because the whole firing mechanism was part of the barrel, it was functional at all times, regardless of the barrel’s elevation. The projectiles were fired quickly and with decent range and impact, which were nevertheless lessened by the 31 cm long barrel. I have made sure the barrel was completely smooth inside and had inner diameter of 1×1 stud, that is larger than the actual projectiles. This followed a lesson I’ve learned with earlier version of the barrel, which had beams on top and bottom, but plates facing outwards on the sides. In this case, the projectiles had to go between plates’ bottoms, and when long enough, such a barrel would stop them completely. In the end, the tank was equipped with barrel of accurate length and with elevation/depression range better than in the original, but at the cost of somewhat impaired range and impact of the projectiles. 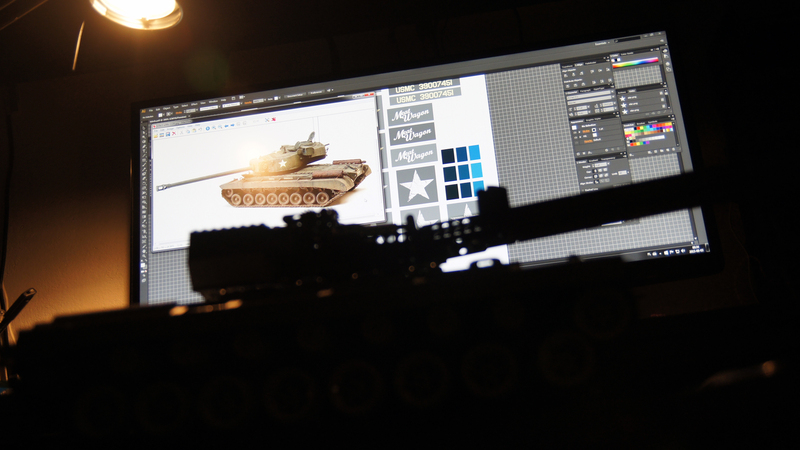 On the aesthetic side, the tank was far from perfect as my priority was the functionality. A number of compromises has been made, including the front glacis plate which wasn’t angled as much as in the real tank, and which included a massive and ugly cover of the machine gun, necessary to hide the pieces forming its ball-mount. The lower back of the hull wasn’t inclined enough and the same applied to the sides of the turret bustle – I was limited here by the battery sitting inside. 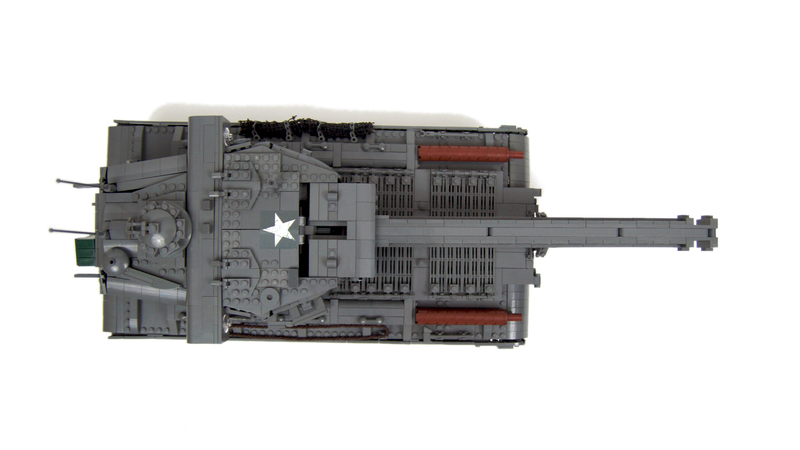 I was particularly unhappy with the turret’s front which was somewhat malformed by the oversized gun mantle (necessary to cover the firing mechanism) and three panels connecting to it: one on the top and two on the sides. The side panels were too tall, with too angular upper edges, while the top panel, subsequently, was too flat. 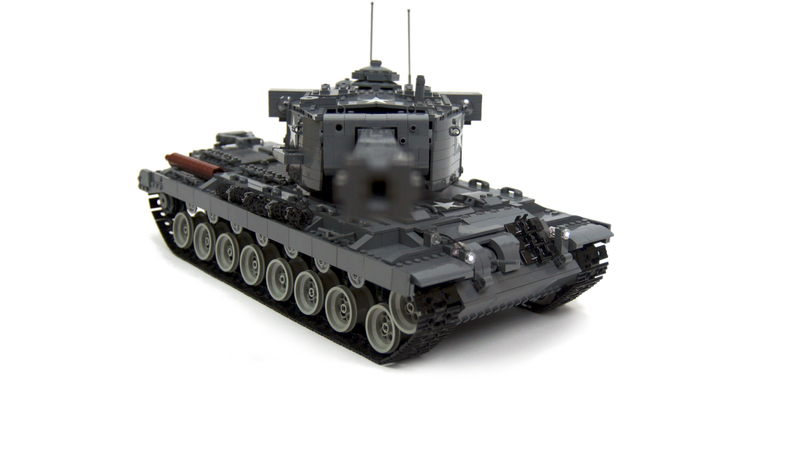 The turret of the real T29 has roof broken in two, forming two slopes that come down and then join the side panels. 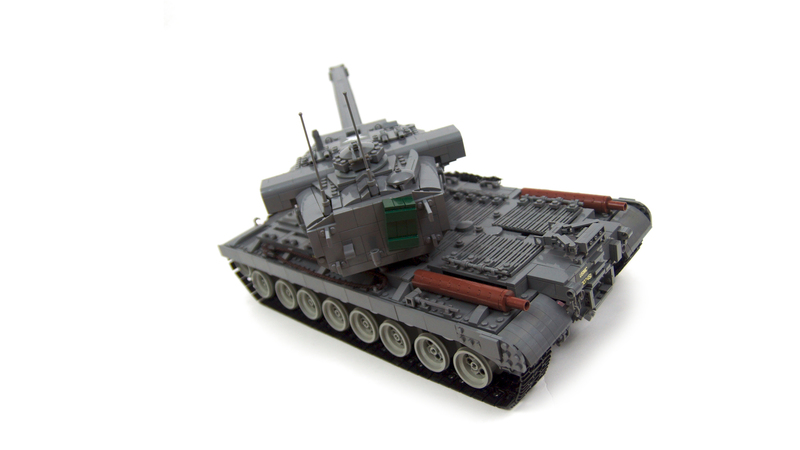 In this model, the massive mechanisms filling front of the turret forced me to flatten its roof and make its side panels go higher – thus the distinctive sloped roof was almost entirely flat. 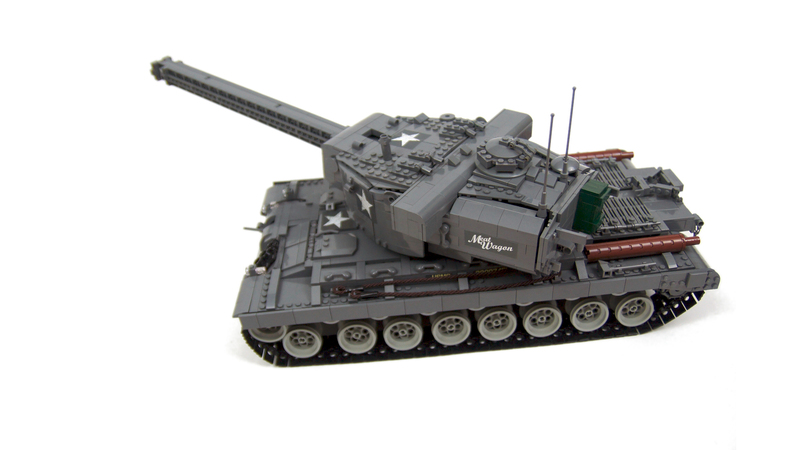 All in all, this model was quite entertaining, but its turret’s exterior proved more challenging than with any of my earlier tanks. 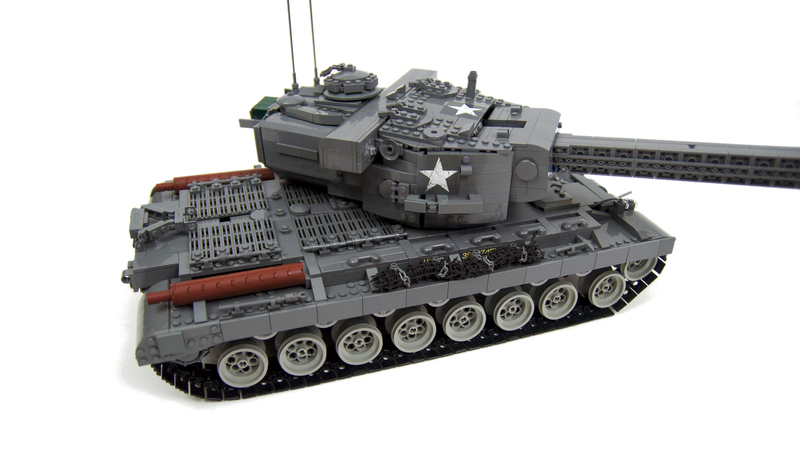 I have used a great number of unusual building tricks – for example the “ears” on the turret were built with studs facing in three various directions. Many elements had to be offset by half of a stud, and I was frequently connecting bricks bottom-to-bottom. 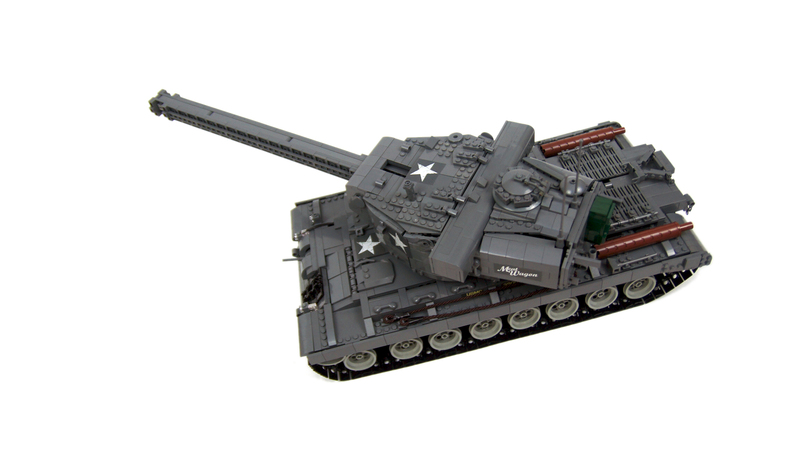 While this did not in the end produce accurate looks, I think the tank was still recognizable and pretty interesting functionally. 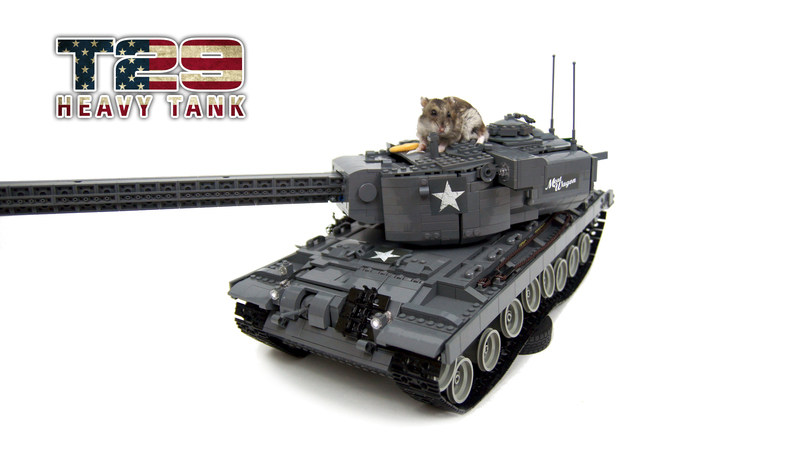 I love this tank model! 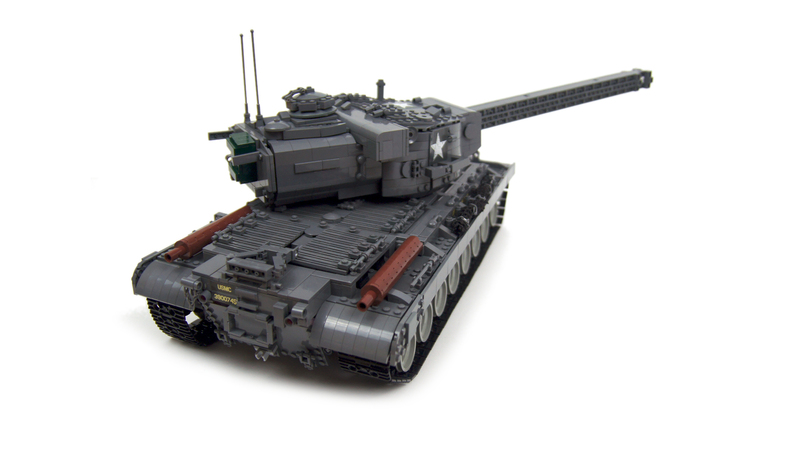 The only problem that I could see was the turret looks like it’s going to fall off. 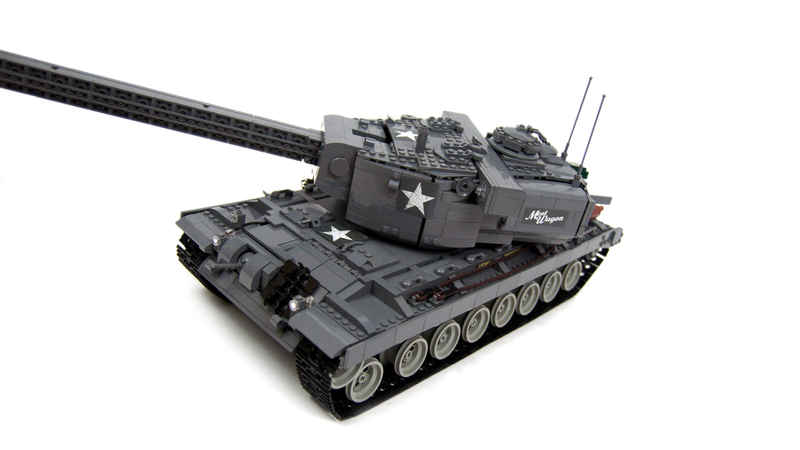 Is this because of the weight, or something that actually replica’s the original tank when it moved? Im refering to the unobstruct switch. Is it a gear switch or PF switch to engage/disengage the tank engine? Yes, two L motors were strong enough. 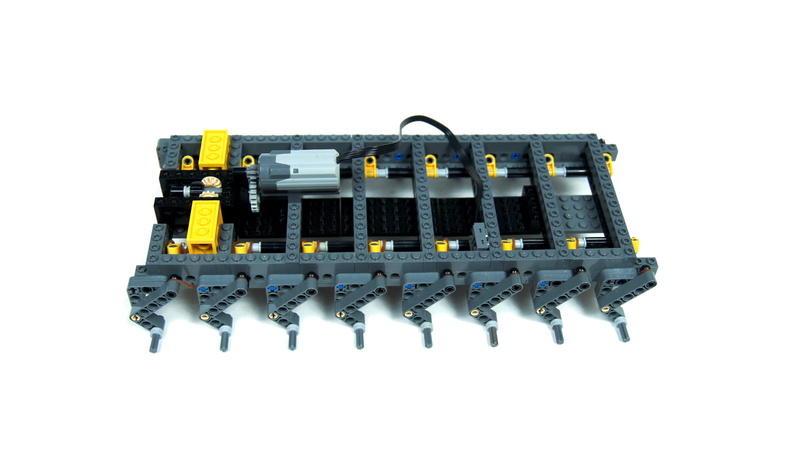 The on/off switch is simply a plate sitting on top of the button on the Lego 8878 battery. Its confirmed tat the L motor will cause damage to the 8 teeth gear if the gear move the spring loaded to the front. I switch to m motor and the 8 teeth gear work fine, even accidentally to make the motor move the spring loaded forward wouldnt cause damage to the 8 teeth. 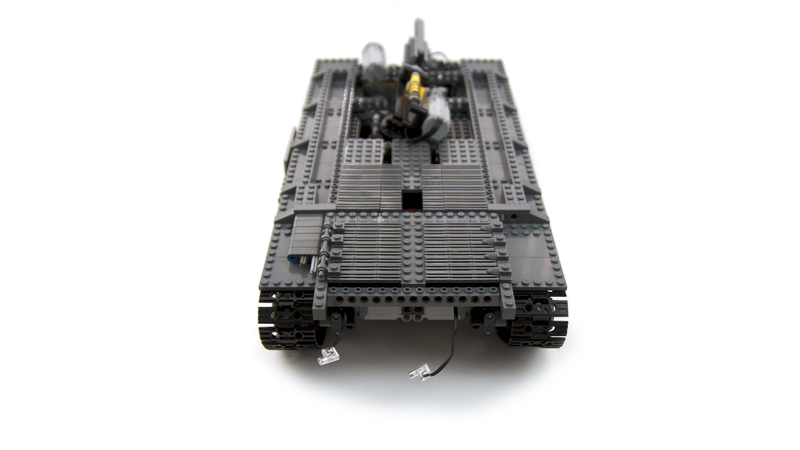 Btw, you are only using 1 battery box to power the entire tank ( 8motors in chassis, 2 motors in turret). 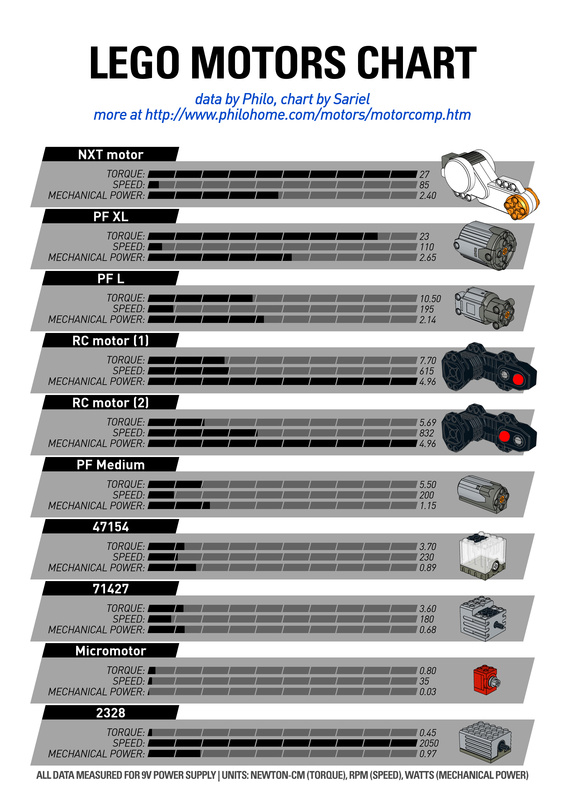 L motor strong enuf to move the entire tank? 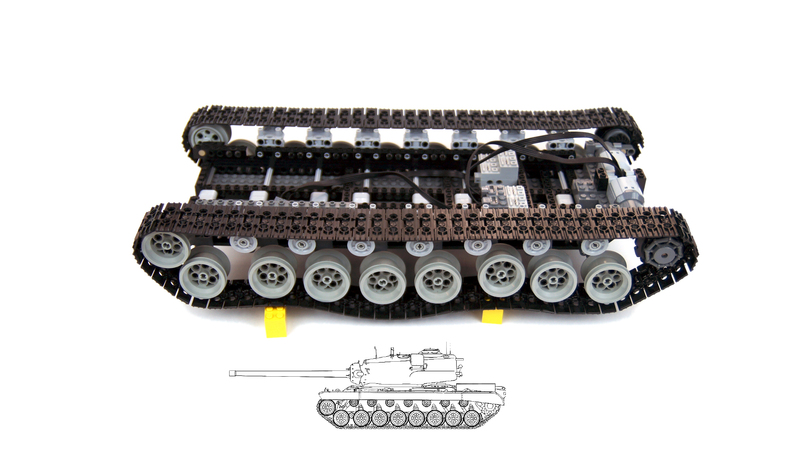 I tried building similar tank with motors to open deck, “power” the engine. This exert xtra weight and I’m using XL motor to power the track. But I realise with 2 XL motors, the battery box has nearly reach its limit, and it could barely move the tank since I coupled all power to the battery box. Direct connection of the sprocket wheel to the XL motor cause it to discouple if tank move too fast. Putting 1 more battery box will result in unable to add the misc motor for the the steerable gun, and engine deck. How do you make the engine on/off switch? The 8t gear never got damaged for me. Maybe you’re using some old, weak version of the 8t gear. 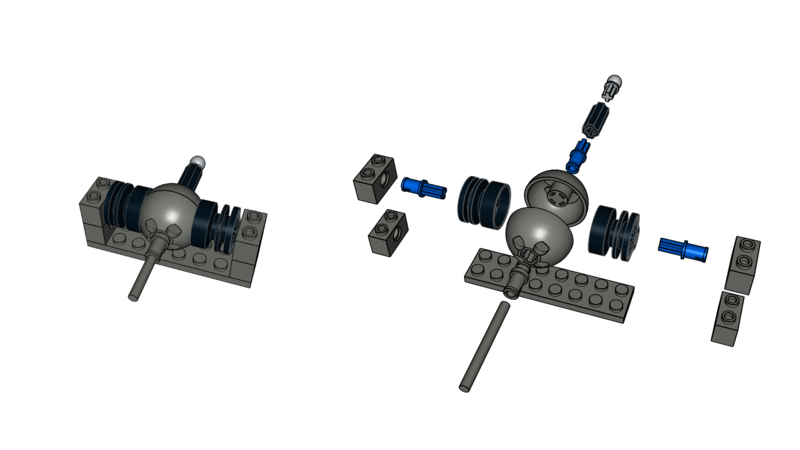 I build the firing mechanism. After a few firing of the “tank cannon”, the Gear 8 Tooth will get damage. 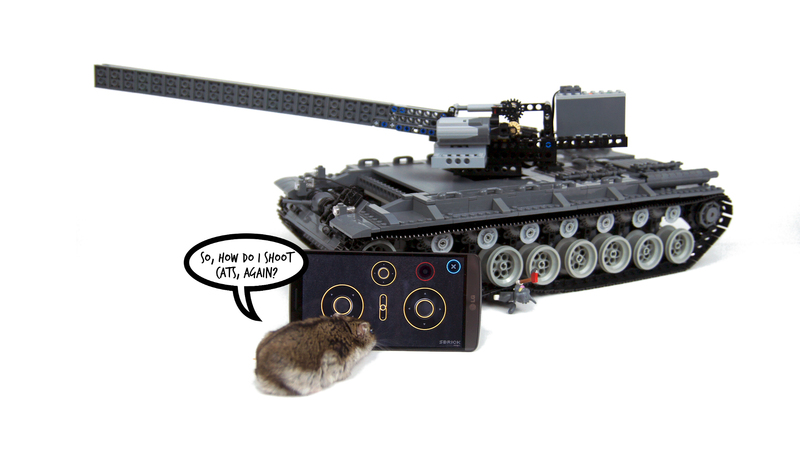 According to the build instruction, a L-motor is used, but in the video, a m-motor was used. Does it really matter? Anyway the MG ball mounted where to get it? 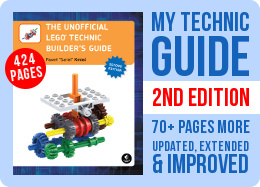 What is the lego part no for the “wheel”? Hi! How can I get the full instructions? 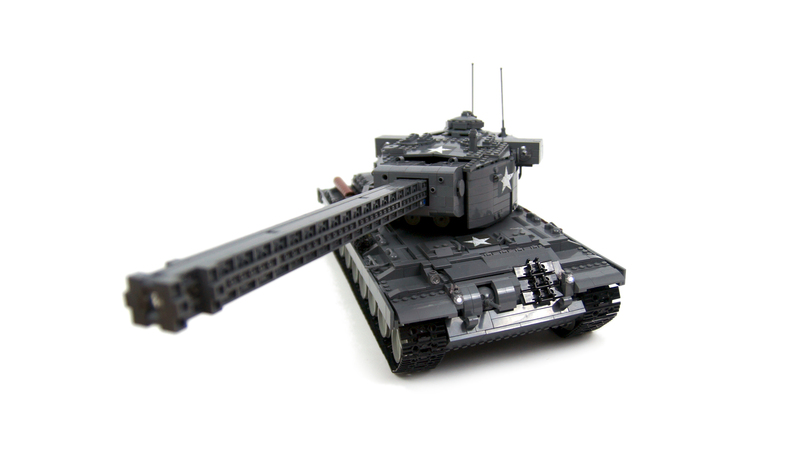 I think is your best tank! I guess I rely on experience with earlier models and study the original vehicle extensively. How do you start/plan such a large project as this? That’s 1×1 beam. You can use a bush instead. Hi, Thanks for the free instruction. BTW, what is the part no. from the pdf at page 1, instruction 4, 1st item? 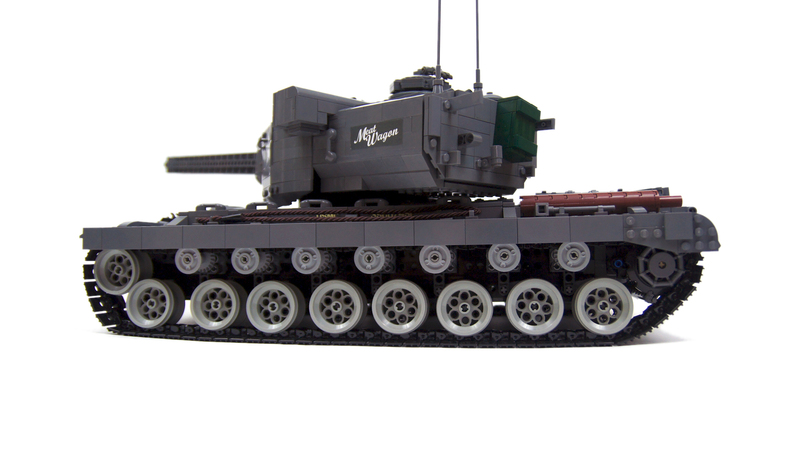 I try using a Large Shock Absorber (18404), the gunnery still able to fire. You can make whatever model you like. Sure, the old turntable will work too and the phone is G3. 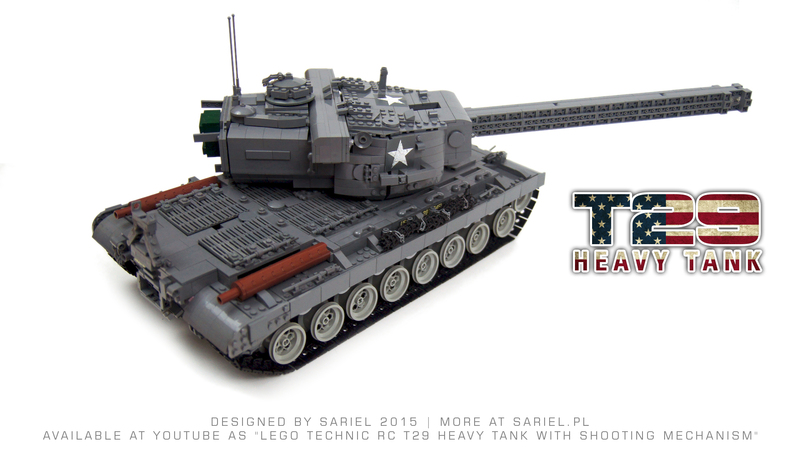 Hi Sariel you this is a awesome model.I am planning to make this same model and put it on my website Is it Ok? Can the turret be made using the old turnable? And is the phone u have LG g3 or LG g3 stylus. I didn’t use a knob gear. Could you post a few more pictures of the firing mechanism you made? I’ve been putting some basic motorized rc functions in my younger brothers’ sets for them to play with. I’ve been trying for a few weeks but haven’t been able to make a firing mechanism that small yet. I’ve been using a cam to pull back soft absorber, but hadn’t thought of using a knob gear. That alone should save some space. If you are too busy, that’s fine. Thanks for the inspiration! Your designs are brilliant.